Souvlaki is the term used to describe “little skewers” of meat that are marinated in a wonderful red wine marinade and then grilled. Souvlakia are traditionally wrapped in flatbread or pita and then topped with a variety of condiments - lettuce, tomato, onion, and of course, the famed tzatziki sauce. They are also quite delicious without the pita and trimmings. You will need to plan ahead and allow at least 2 – 3 hours for the meat to really absorb the flavors. If using wooden skewers, cut 8 to fit your griddle pan and soak them in a tray of water to stop them burning. Put all your kebab ingredients into a bowl and use your clean hands to mix everything together really well. Cover with clingfilm, then pop into the fridge for a couple of hours or longer if you want the flavours to get a bit more intense. Meanwhile, blacken the peppers directly over the flame of your hob, in a hot dry griddle pan or under a hot grill. Turn them every so often and when they look almost ruined, pop them into a bowl, cover with clingfilm and put to one side to steam for 5 minutes or so – this will help their skins to come off. Make your tzatziki by coarsely grating the cucumber into a sieve set up over a bowl. Add a few good pinches of salt, then use your hands to squeeze out as much water as you can. Pour the water away, then tip the cucumber into the empty bowl and add the yoghurt. Pound the garlic in a pestle and mortar with a good pinch of salt until you have a paste, and spoon that into the bowl with the cucumber. Add the dried mint and red wine vinegar and mix really well. Have a taste to make sure you've got the balance right, then put aside. Preheat a griddle pan or grill on a high heat. Thread the skewers through the marinated pork pieces, leaving little spaces between them so that the heat cooks everything evenly. Cook the kebabs on the screaming hot griddle or grill for about 8 to 10 minutes, turning occasionally until done on all sides. Warm your flatbreads in the oven or in a hot dry pan while your kebabs are cooking. Just before your kebabs are ready, peel and deseed your blackened peppers, then tear them into strips and put them into a bowl. Roll up your mint leaves, finely slice them and add to the bowl along with the dill. Add a few splashes of red wine vinegar, a pinch or two of salt and pepper and a lug of extra virgin olive oil. Toss and mix together, then have a taste to check the balance of flavours. Cut your lemon into wedges. 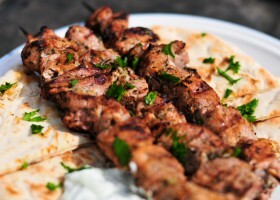 Put a dollop of tzatziki and the meat from one skewer on each warmed flatbread. Top with some of your pepper mixture, a drizzle of extra virgin olive oil and a good squeeze of lemon juice. Life doesn't get much better. Gourmet Scratch Map © & Luckies is a trading name of Luckies of London Ltd. Courtyard Studio 2, Old Gramophone Works, 326 Kensal Rd, London W10 5BZ A company registered in England and Wales with company number 5388393. Registered Office: 119 The Hub, 300 Kensal Rd, London W10 5BE VAT number 858600507 All prices include VAT | Scratch Map .